Regulated medical waste, as defined by the 1988 medical waste tracking act, is understood to be waste that is generated during the diagnosis, treatment or during immunization of humans or animals in a healthcare setting. There are special exceptions to this which we will not cover in this blog but to stay focused we are referring to healthcare professionals which includes dentist, veterinarians, medical physicians and so on. Regulated medical waste is a waste that requires special handling and disposal which normally requires a service to safely transport this waste to a licensed treatment facility that is permitted to manage such waste. OSHA at a high level requires all healthcare professionals to properly contain and dispose of their waste. Individual states however have the power and have exercised that power to add additional requirements in managing this waste based on the amount of waste generated by a facility. These additional requirements can include storage limitations and specific waste segregation practices. Furthermore, most states identify waste generators in two volume categories; small quantity generators (SQG) and large quantity generators (LQG). For accuracy it is important to note that the requirements for SQG and LQG differ greatly by state so we recommend every facility to research their specific state regulations before making any decisions about their service. For a link to all state requirements for medical waste CLICK HERE or visit (www.pureway.com/resources/map). There are two main options available to generators of regulated waste in the North America. These two types are contracted pickup services and mail back services. These two services are very different but both provided a compliant and safe method of properly containing and disposing of your waste. Medical waste pickup services is a service that in most cases requires a 3-5 year contract and involves the delivery and pickup of collection bins or boxes by which a healthcare facility will place their regulated contaminated medical waste in when generated. The medical waste pickup service will setup a pickup frequency where they will pickup this waste on a predetermined schedule. A frequency can be daily, weekly, monthly or even less frequent during the year. The pickup boxes or bins can vary in sizes from 18 gallons size boxes to 200 gallon bins and larger depending on the amount of waste generated in the office. This type of service is traditionally used for LQGs. A mail back system is simply a medical waste container that is prepackaged in a prepaid shipping and return shipping box that has been approved and authorized to be transported through a regular shipping carrier (USPS/UPS). In order for a mail back system to be authorized to ship, the system must first pass the rigorous testing requirements identified in the domestic mail manual for the United States Postal Service. These testing requirements are specifically designed to test the integrity of each system and ensure they are safe to ship such waste as sharps containers, needles, syringes, and other regulated waste. There are three types of medical waste mail back systems which are single mail back systems, multi-pack systems and collection bin systems. Single mail back systems include one OSHA approved sharps container, return shipping box, prepaid return shipping label, instructions for use, poly bag to secure the container in when full, zip tie to seal the bag and tape to secure the box for return shipping when ready. 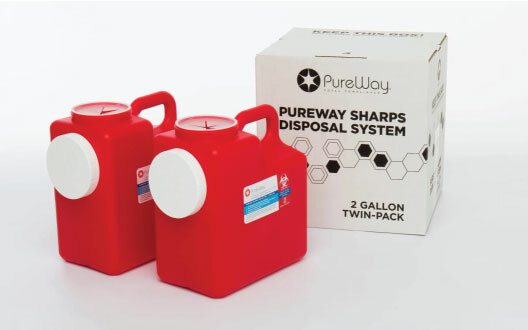 Multi-pack mail back system includes the same items as the single mail back system but a multi-pack system comes with multiple OSHA approved sharps containers (pictured above). These systems come with two, four or even 6 sharps containers in one mail back box. Collection bin mail back system includes one large collection bin and all of the components to safely seal and ship your collection bin. With this type of system you can place existing waste and existing sharps containers that may have been purchased from a medical supply company and previously filled into the collection bin and shipped in for treatment. Medical Waste Mail Back vs. Pickup Service, which is better? Cost - which method will cost you the least in the long run. One expense that is often overlooked in this equation is the cost of sharps containers. If a facility does decide to use a weekly/monthly pickup trucking service they will most likely be required to also purchase sharps containers that range from $10-$30 a piece. When using a mail back system (single and multi-pack systems) sharps containers are already included which can be a major savings! Convenience - Depending on how much volume a facility generates can add to the complexity of the process for disposing of your waste. If a facility is constantly filling large medical bins every few days or week, then you will most likely prefer a medical waste pickup service that removes full containers on a regular basis. Compliance and tracking - Make sure the company you end up choosing is permitted to manage the type of waste you are generating and has an online tracking system that helps your facility tracking, document and maintain a active file ongoing. This will save your facility time, reduce liability and give you peace of mind knowing all documents are in place if a audit were to occur unexpectedly. Depending on a facilities volume of waste generated will determine whether a mail back system or medical waste pickup service is better for a facility. Each service has many pros and cons but traditionally a pickup service will be a better fit for a larger facility generating 50lbs of waste or more per month and a facility generating <50lbs of waste per month will benefit more from a mail back system.